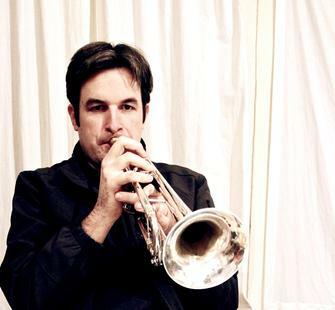 Kris Tiner is a California-based trumpet player, composer, and improviser. Featured on NPR Music as one of a handful of new trumpet voices impacting modern music, his playing has been described as “extraordinarily inventive” in Signal to Noise magazine, and the LA Weekly claims “Trumpeter Kris Tiner can turn barbed wire to beauty.” Tiner’s compositions explore connections between improvisational world music traditions and systemic compositional practices, blending deep jazz roots with references to many diverse streams of contemporary and experimental music. His music has been performed on five continents, his 50+ recordings have been enthusiastically reviewed in the international jazz press, and he has been recognized with awards from ASCAP, the American Composers Forum, Chamber Music America, the International Association for Jazz Education, Montalvo Arts Center, and the Kennedy Center. He is a member of the acclaimed Empty Cage Quartet, and he collaborates with New York guitarist Mike Baggetta in the duo Tin/Bag. He performs with the Industrial Jazz Group, Chris Schlarb’s Psychic Temple, pianist Cathlene Pineda, the Los Angeles Trumpet Quartet and the Jeff Kaiser Ockodektet, and has collaborated with Wadada Leo Smith, Vinny Golia, Kraig Grady, Tatsuya Nakatani, Donald Robinson, Nels Cline, Lukas Ligeti, G.E. Stinson, Motoko Honda, Phillip Greenlief, Jack Wright, Harris Eisenstadt, and Michael Vlatkovich. Tiner holds an MFA from California Institute of the Arts and a BA from CSU Bakersfield. He directs the Jazz Program at Bakersfield College, and is the Trumpet Studio Instructor at CSU Bakersfield. He is the founder of Epigraph Records, an independent label dedicated to the documentation of new creative music recorded live in Bakersfield.